Herons are members of the Ardeidae family, which are large wading birds with long bills, necks and legs. 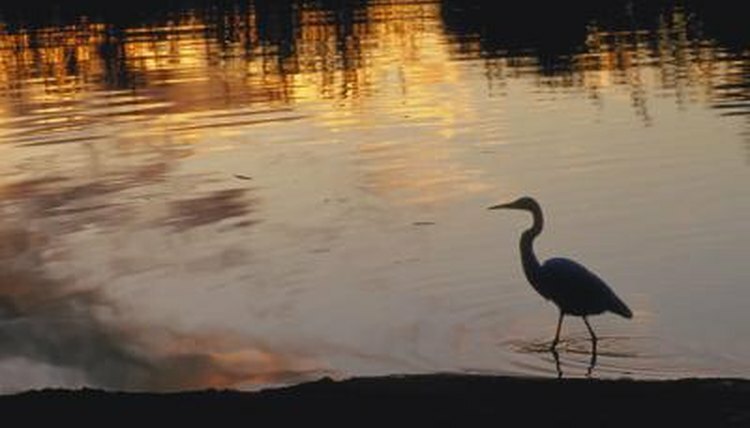 There are 60 species of heron, six of which are native to Colorado, including the largest and most well known of these birds, the great blue heron. Great blue herons (Ardea herodias) are large birds that stand up to 4 feet high and weigh up to 8 pounds, with a wingspan of 7 feet. They can be found all over North America, with many migrating to Colorado in the spring, returning to the same nesting site year after year. Due to human development and contamination of their nesting sites, great blue herons are a threatened species, with only 1,600 nesting pairs remaining in Colorado. Colorado great blue herons prefer wetlands such as marshes, swamps and riverbanks between 4,000 and 9,000 feet in elevation, and build their nests in deciduous trees at heights of 40 to 70 feet. They are not social birds, and pair up only to mate and nest. These herons live on a diet primarily consisting of fish, which they catch by wading into shallow waters and grabbing with their bills. Tricolored herons (Egretta tricolor), formerly known as Louisiana herons, migrate to Colorado in the late summer months, but are more common in the southeastern United States. Tricolored herons are small, standing only 2 1/2 feet high, with a wingspan of 3 feet. Their bodies are blue, with white bellies and red necks. Rather than remaining in shallow waters to feed on fish and frogs, tricolored herons venture into relatively deep waters for their small size, so they appear to be swimming rather than wading. Little blue herons are rare in Colorado, but may be seen migrating to Colorado's plains and shorelines. They mainly inhabit marshes, rivers and estuaries, where they nest in trees or shrubs. Their diet consists of fish, amphibians and invertebrates, which they catch by stalking the prey in the water. These herons are medium-sized, standing 2 1/2 feet high and weighing less than a pound. They have a wingspan of up to 3 1/2 feet and are pure white when young; after one year their bodies and plumage turn deep blue. Green herons (Butorides virescens ) are short, stocky birds with green backs, brown bodies and dark blue heads, sometimes with feathered crests. They stand only 1 1/2 feet high, weigh up to a half-pound and have a wingspan of just over 2 feet. These herons catch fish by using lures such as twigs or insects to trick fish into coming close enough to be snatched into the heron's bill. Green herons do not live in Colorado year-round, but pass through as part of their migration routes that take them throughout the southern U.S. and Mexico. The black-crowned night heron (Nycticorax nycticorax) is the world's most common heron, inhabiting large regions of North and Central America, as well as Europe, Asia and Africa, where they live in large wetlands. This heron is also stocky, with a length of just over 2 feet, a wingspan of 3.8 feet and a weight just over 2 pounds. Their coloring consists of black on their heads and upper backs, with grey wings and tails and lighter grey or white underbodies and black bills. These herons are social, monogamous birds who nest communally and will help raise heron chicks that are not their own. They are foraging birds, feeding on fish, crayfish, amphibians, other birds and even garbage. The yellow-crowned night heron (Nyctanassa violacea ) is a nocturnal bird that's rarely seen in Colorado, passing through during its summer migration. These birds are 2.3 feet tall and weigh 1.7 pounds, with gray bodies, black faces and bills that feature white cheeks, and yellow crown strips atop their heads. They nest communally, occasionally with other bird species, and feed primarily on crustaceans, including several types of crabs and crayfish.